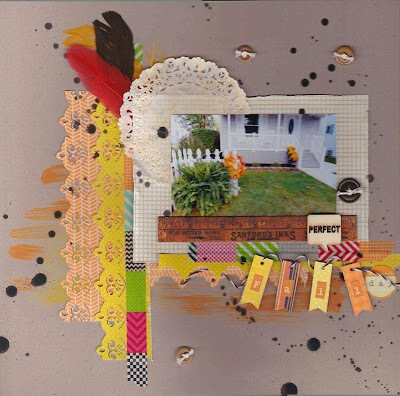 It‘s Monday and time for another challenge on the Kaboodle Doodles Challenge Blog. This week the challenge is: “Halloween Anything Goes”. I LOVE banners! For this challenge I made a banner which resembles candy corn. Link your project to the inlinkz tool on the Kaboodle Doodles Challenge Blog. To be eligible for the prize draw you need to be linked by Sunday, November 3rd. One random drawn prize winner will receive a 4 images from Just Some Lines. Be sure to check out the Kaboodle Doodles Challenge Blog to see the fabulous work by the other Design Team Members. Today I have a project up on the Just Imagine Crafts Blog. Randy and Jessica both said that this is their new favorite page of Gracelynn. I created a border for the top and the bottom of the page using the Kreaxions 4 in 1 punch # 903. I love that this punch looks like eyelet lace. I used the positive part of the punched border on the top of the layout and the negative section for the bottom of the layout. I purchased this hair bow from Sugar Sweet Boutique shortly after Gracelynn was born. I thought she would wear it for her first birthday. Although Jessica did a photo shoot with Gracelynn wearing the “BIG” bow … I think it is something she will have to grow into lol! It‘s Monday and time for another challenge on the Kaboodle Doodles Challenge Blog. This week the challenge is: “Halloween Colors”. The October teacher gifts for my grandsons teachers were the perfect fit for this challenge. I made these treat containers out of StarBucks jars. I filled the jars with Hershey Kisses and a few spiders. Adding the tag and ribbon were the finishing touches. To be eligible for the prize draw you need to be linked by Sunday, October 27th. One random drawn prize winner will receive a 5 digis from QKR. Today there is a Design Team reveal up on the Just Imagine Crafts Blog. The theme is “Fall” I decided to complete a fall page using a photo of our new front porch. I used the Kreaxions 4 in 1 punch #305 to create a border. Be sure to check out the blog for the rest of projects completed by the Design Team. It’s time for the October Mini Crop at the Scrapping Turtle. This month the themes are: Fall, Color Your World, Canadian Thanksgiving and Halloween. Pumpkins add stylish, creative and fun touches to your Halloween/Fall decorating. When I was in JoAnn’s I saw this Kraft paper Mache pumpkin and I swear it was calling my name. My first thought was all that washi tape that’s in my stash (that I always forget to use). So my challenge to you is to use tape on a Halloween or fall project. Any kind of tape, washi, paper, masking, duct tape … anything goes. Be sure to check out all the challenges from the Design Team for the October Mini Crop at Turtle Soup! I also have a project up on the Just Imagine Crafts Blog today - Halloween treat bags. The October Afternoon Witch Hazel paper along with the Kreaxions 4 in 1 punch #301 is the perfect combination. I distressed the edges of the paper to get the vintage feel I was going for. It‘s Monday and time for another challenge on the Kaboodle Doodles Challenge Blog. This week the challenge is: “earth tones or colors”. I decided to make a fall card (using up paper scraps) for this challenge. To be eligible for the prize draw you need to be linked by Sunday, October 13th. One random drawn prize winner will receive a $10 voucher from Di’s Digis. 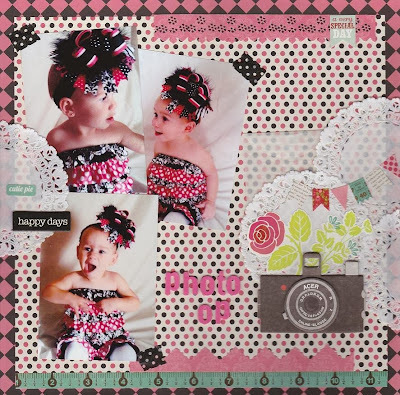 Scrapbooking for 5 grandsons is great but having a granddaughter has given me the opportunity to do some girly girl pages … and I love it! For Gracelynn’s layout “Princess In Training” I used the Kreaxions 4 in 1 punch # 903 to create a border on the large photo mat. I made the banner out of paint sample cards. I punched them using the #903 punch also. I’m always amazed at how many different looks you can get using the same punch in different ways. 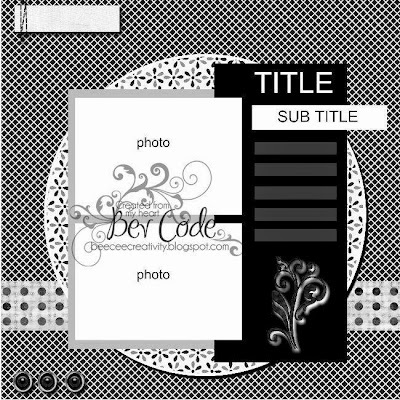 First a layout I completed for the October Design Team Sketch Reveal at Scrapping Turtle. And second today’s challenge for Kaboodle Doodles - Pumpkins. On Pintrest I saw an apple done like this. If you could do an apple … why not a pumpkin!? I love the way this turned out! And to think it only took an old book, some spray paint, a twig and some ribbon. One random drawn prize winner will receive digis from Eureka. Come and celebrate World Card Making Day with us at Turtle Soup today. The Design Team has several challenges posted. My challenge is to make a “shaped card” - anything but a square. 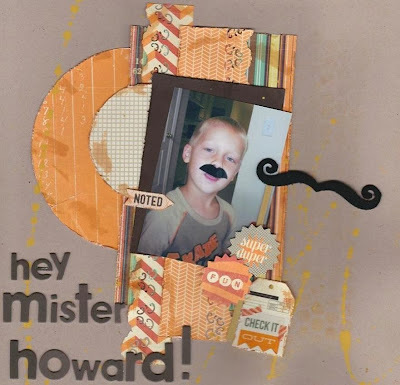 Making different shaped cards is a way to add interest to you creations. So get out those die cutting machines or your templates and have fun creating! I made a card for Halloween using my Cricut and the Mini Monsters cartridge. Remember the pack of mustaches I bought the grandkids? By the looks of this photo Elisha enjoyed his a lot more than Gracelynn did lol! I only have 5 more mustache layouts to do. One for each of them … hope I don’t run out of ideas! For this layout I used the Kreaxions Circle Cutter and the Kreaxions 4 in 1 punch #918.